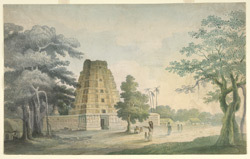 Watercolour of a street scene outside a south Indian temple, by an anonymous artist working in the South India/Madras style, c. 1800-1810. The scene depicts a large entrance gopura to a Hindu temple that faces a village street. The painting style is almost entirely in the English manner. Gopuras are huge pyramidal entrance towers typical of South Indian temple architecture of the 16th and 17th centuries. They consist of a stone basement and a multi-storeyed brick and plaster tower and are capped by a barrel-vaulted roof. The arched ends are decorated with a multitude of sculptures that depict the divinities from the Hindu pantheon. Passing through the gopuras brings the devotees into the temple precinct.